Perched on the coast, Sun Salutations Villa has spacious, modern interiors and stunning views that make it an ideal spot for your next vacation getaway. This villa’s large Great Room is an excellent spot for entertaining or relaxing while enjoying the stunning ocean views. If you’re looking for a night out, there are restaurants within walking distance at the Rum Point Club. To top it all off, Sun Salutations sits on a beautiful sandy beach. Modern and bright with amazing views! 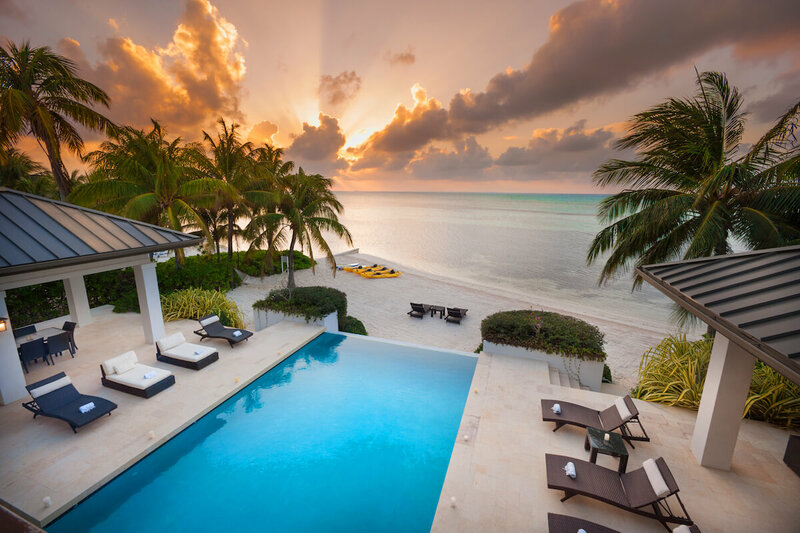 Sun Salutations is a two-story villa in Cayman Kai on the North coast. This fully air-conditioned beachfront villa is a great choice for a large family vacation. A barefoot swimming beach rests amidst palm trees just beyond the terrace. Two kayaks and two standup paddle boards are available for guests to explore the coast. A hammock is strung between two palm trees for afternoon naps, and lush greenery borders the property for privacy. A few steps lead up to the terrace, where guests can sunbathe in loungers and daybeds or feast and grill in the gazebo. Stroll through the Zen garden for meditation and refreshment, or swim laps in the infinity pool to unwind. Sliding glass doors lead in to the Great Room, which stretches across the first floor. Two sectionals face each other in the living room to create the perfect layout for long conversations and late nights. Dining tables sit on either side, and the kitchen is adjacent. All-white countertops span both sides of the kitchen, and stainless steel appliances equip the space for any meal. Near the entryway, there’s a cozy suite with two twin beds, an Apple TV, and an adjacent bathroom. There’s also a half bath by the pool terrace. Upstairs, four king suites and a bunk room accommodate 14 guests. Each of the king suites has an ensuite bathroom, Apple TV, and balcony access. In the bunk room, there’s two bunk beds with twins on top and fulls on the bottom, as well as trundles underneath each set. The bunk room shares a bathroom with one of the king suites. Sun Salutations Villa is only 200 yards south of the Rum Point Club. Guests can walk there for drinks, meals, or water sports. This villa enjoys wonderful sunsets and privacy, perfect for any group of travelers. White, wide and barefoot sandy beach with shallow water entry.